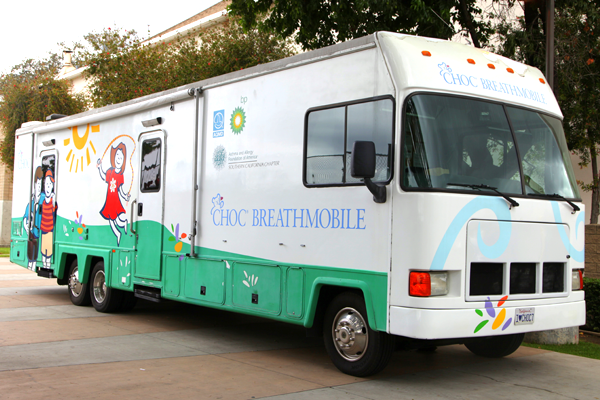 The CHOC Children’s Breathmobile is the only mobile asthma clinic dedicated to serving preschool and school-aged children in Orange County. Our two 36-foot RV-style clinics travel to 22 schools and community sites providing asthma care, diagnosis and education. Each location is visited every four to six weeks, meaning children have comprehensive follow-up care with a familiar team until their asthma is under control. 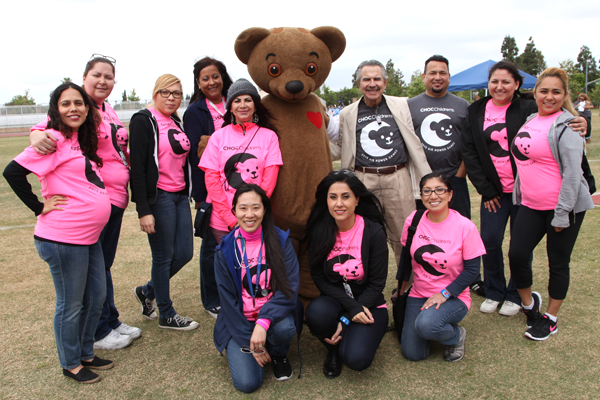 The Breathmobile is an important community service that removes barriers for children and their families who may be unable to travel or pay for preventive asthma care. Each Breathmobile features two fully equipped exam rooms including a Vmax® pulmonary function testing system, which uses spirometry and oscillometry tests to measure a child’s ability to breathe. The Breathmobile travels with asthma-trained bi-lingual providers and staff, who complete an asthma and allergy evaluation for each child. The evaluation includes a comprehensive history of the child, a physical exam, a breathing test and a skin test. Children may receive medical treatment for asthma and allergies, including medication, spacers and home peak flow monitoring. Our team helps children and their families create an Asthma Action Plan, and we offer education on how to manage their asthma, avoid triggers and prevent asthma emergencies. We provide follow-up appointments with children until their asthma is under control, a process that typically takes about three visits. Each child sees the same team of caregivers every time, so they can feel comfortable in a familiar environment. We also refer children and families to additional county and community resources as needed, and we provide assistance for them to obtain health insurance if they wish. In some cases, we may provide a home visit to assess a child’s home for asthma triggers and educate families on ways they can modify their home to prevent symptoms. The Breathmobile began in 2002 through a partnership with the Asthma and Allergy Foundation of America, Southern California Chapter, as a new and innovative program to address pediatric health concerns, specifically regarding asthma and allergy. It was the vision of CHOC asthma and allergy specialist Dr. Stanley Galant. The goal of the program is to provide access to preventive asthma care for under-served children and improve their quality of life. Since the program began, the Breathmobile has provided asthma care to more than 6,500 children. In 2014 alone, more than 1,400 patients were provided care during approximately 4,000 visits. The Breathmobile currently depends heavily on philanthropic support and in-kind support from donors. The Breathmobile continues to seek additional funding in order to continue providing care to our current patients while enhancing our services to meet the needs of additional patients. Donate today. Asthma is the most common chronic illness in childhood. In the United States, approximately 10% of school-aged children have been found to have significant bronchial asthma. In the inner-city minority population, the prevalence of asthma is more than 20%, and is frequently under-diagnosed and under-treated, according to Breathmobile-led research. It can lead to serious disability if left untreated. Asthma also causes more school absenteeism than any other chronic health condition. In fact, our research shows 40% of Orange County children miss five or more days of school per year because of asthma. In addition, approximately 30% of children visit the emergency room and 5% are hospitalized each year because of this condition. Fortunately, with proper asthma care, children are far less likely to miss school or need emergency or hospital care, and they are proven to have a higher quality of life. 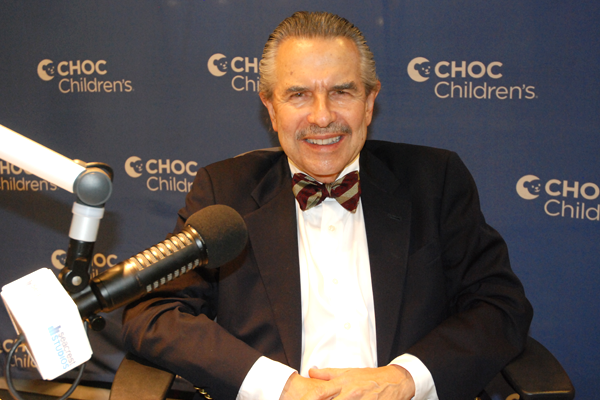 Learn about controlling asthma in this CHOC Radio podcast with Dr. Galant. The Breathmobile serves as a training site for residents, fellows, nursing students and pharmacy residents. Training topics include bronchial asthma, atopic dermatitis, food allergies, primary immunodeficiency, anaphylaxis, IgE, mast cells, basophils and eosinophils, drug allergies, allergic rhinitis, pediatric human immunodeficiency virus infection and an overview of the human immune response, all specific to pediatrics and taught under the guidance of Dr. Galant. Methods to predict loss of asthma control with exhaled nitric oxide. The Breathmobile in the News: Learn why it’s better for children to see a trained asthma specialist before their symptoms send them to the emergency room. Our research shows that children who receive care at the Breathmobile miss fewer days of school and are less likely to visit the emergency department because of asthma symptoms. Community providers may refer moderate to high-risk asthma patients ages 1-18 to the Breathmobile. School staff also may refer children to the program using a multi-lingual validated asthma-screening tool. The Breathmobile team works closely with school nurses and primary care physicians to update them on their patients’ care. Learn more about referring a child to the Breathmobile. Please call us for more information on making an appointment or becoming a site for Breathmobile visits. About 10% of children nationwide have asthma. A child should be checked for asthma if he or she experiences chronic or persistent coughing at night; coughing, wheezing or shortness of breath during or after exercise; or wheezing. Effective treatment requires a comprehensive approach and it’s best to have a written treatment action plan, Dr. Galant says. Learn more in this Health feature about kids and asthma. Every year, the Breathmobile hosts the Air Power Games®, a track and field day just for kids who have asthma.